The front page of a leading national newspaper giver shocking details of animal tests in one of Europe's largest laboratories. It is based in the findings of an undercover investigator who worked in the laboratory for eight months earlier this year. Her name was Sarah Kite and in this booklet she gives a personal account of the secret world of suffering she uncovered. She carefully details how she penetrated the high security of Huntingdon Research Centre, the pain and distress of animals, and the attitudes of research workers. 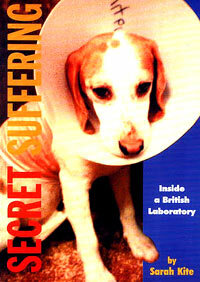 It is a unique, disturbing and deeply moving account of the reality of life and death in a British Laboratory.